We're all chasing after something, something that we think will make us happy-comfort, success, a bigger house, or someone's approval. But if we are all honest, it feels like trying to catch the wind. A man after God's own heart… As David's life weaves throughout the pages of Scripture, we see he was a man who spent his life chasing after God. Chase explores the events that defined David's life and the Psalms that flowed out of those experiences. Through David's example we'll discover what God really wants from us. These discussion cards are designed for use with the Chase Study Guide and Chase Video Study. 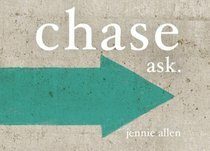 About "Chase Discussion Card Set"
Jennie Allen's passion is to communicate a bigger God through writing and teaching. She graduated from Dallas Theological Seminary with a masters in Biblical studies and is blessed to serve alongside her husband, Zac, in ministry. They have four children, including their youngest son who was recently adopted from Rwanda.